Holiday decorating is so much fun! I needed some extra pieces to add to the Quilt Along runner. I wanted to do another runner for the little bookcase table in the kitchen, along with something for the kitchen counter. I have this adorable kitchen inspired print in Christmas colors, and I wanted to use more of it this year. Last year I did the Christmas Candle Wrapper with it. 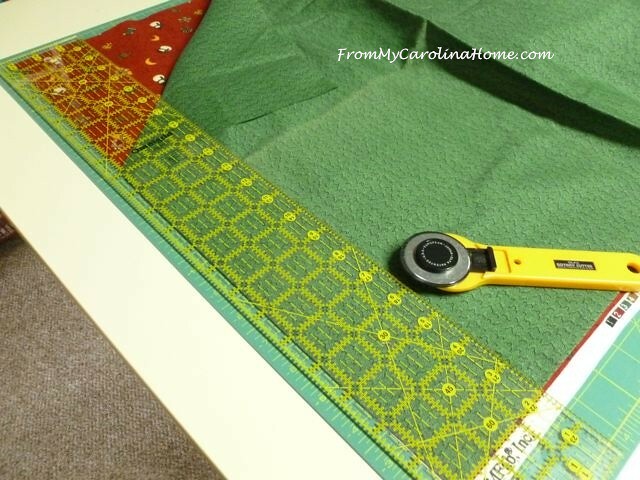 This year, I cut strips of red and green fabrics to coordinate with the print. 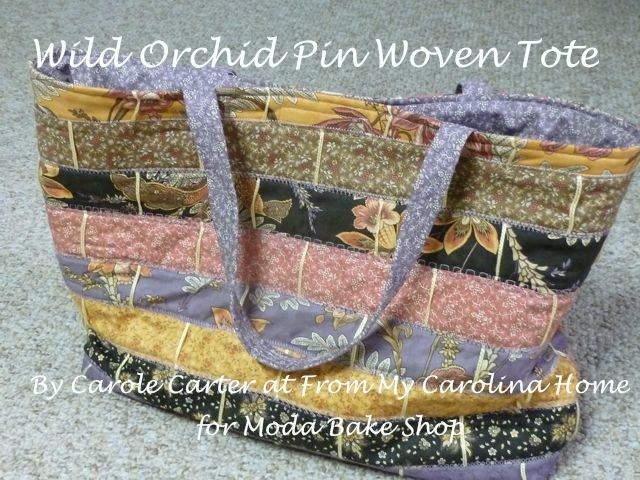 If you want to make this project, just find a focus fabric and cut a piece 8 inches x 32 inches. Then you’ll need 18 red squares and 18 green squares three inches each. I started with 3-inch strips. 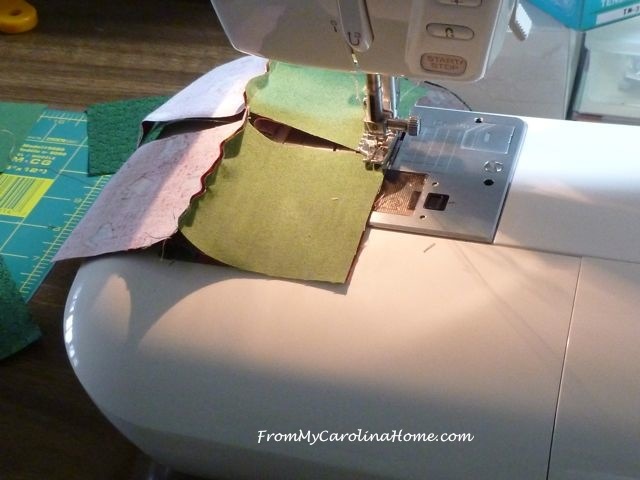 Sew the strips together, then cross cut 3-inches wide into two-square doublets. 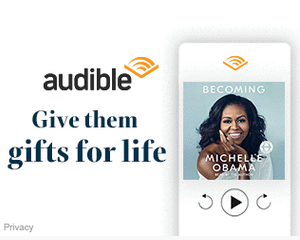 You’ll need to unpick a couple. 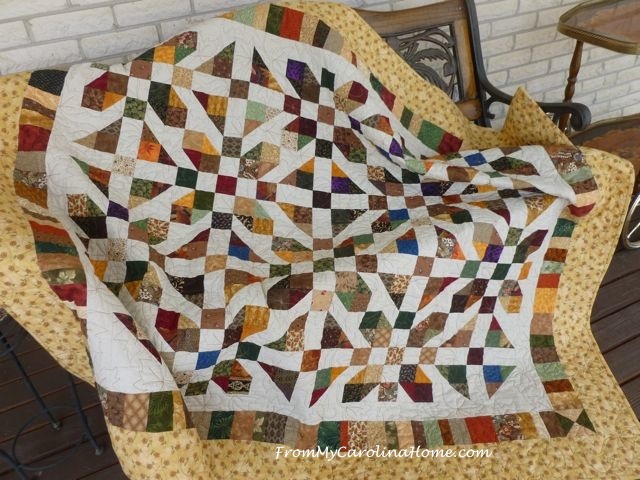 Sew those together for a two color border. Two green squares and one red square were sewn together, then sewn to the ends. The side borders begin and end with red squares, 15 on each side. 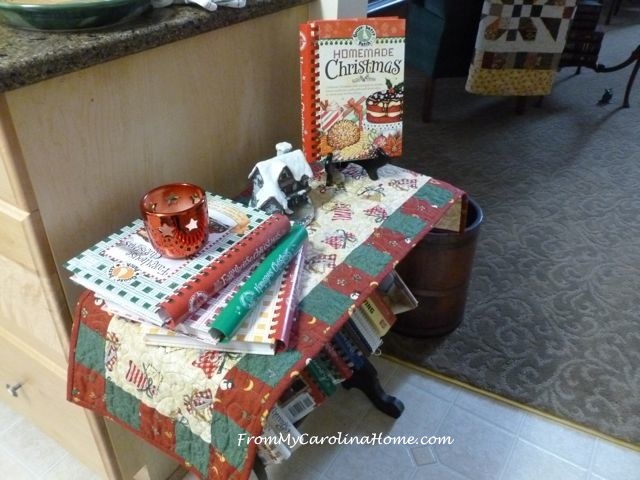 When I read this post on Connie Campbell’s blog Freemotion By the River on her cute Fast and Easy Table Topper, I knew it was a great design for the countertop. All it takes is six pinwheels, two small squares, and one big square cut into triangles. Click on the blue project title to go to her blog for the directions. I made up some quick pinwheels and assembled this little project in under an hour, using those same prints. 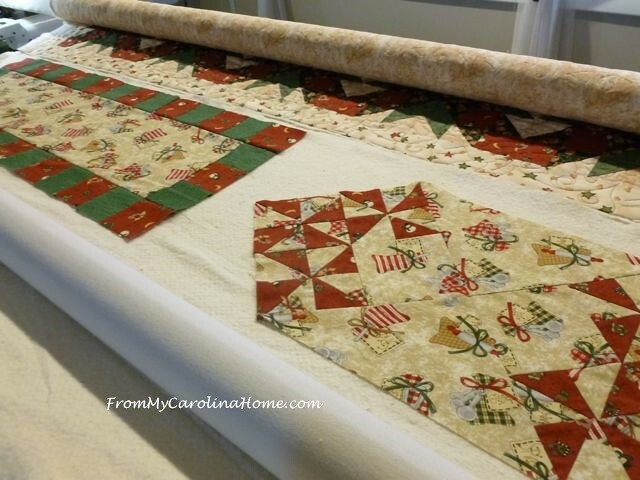 I loaded them onto the longarm frame together with the quilt along runner. Both runners got the Deck the Halls panto. I put a snowflake panto on the pinwheel mini quilt. I wanted a large motif for the center, so I had to start by lining it up with that big snowflake where I wanted it on the piece. Quilting it was really fast since it is small. I think I would have liked this to be a little denser, like Connie did hers. I cut the same red fabric binding for all three projects to make it simpler. They were stitched on one by one. I had a nice Sunday stitching down the binding on the back while watching the football games. The little runner covers the book table in the kitchen. More Christmas cookbooks are set out, these from my Gooseberry Patch collection. 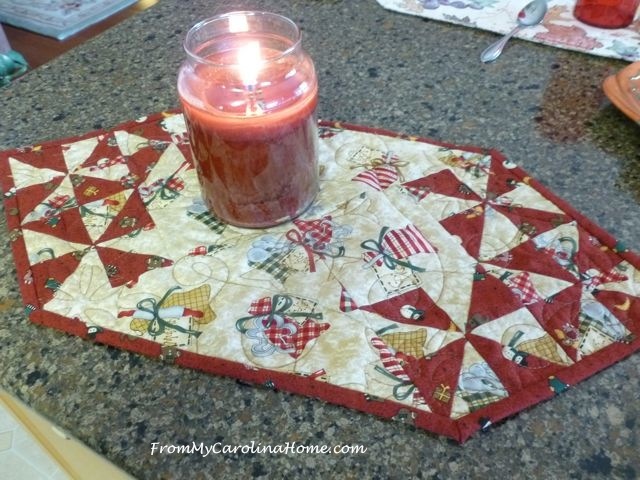 Connie’s Pinwheel Fast and Easy Table Topper was on the kitchen counter. 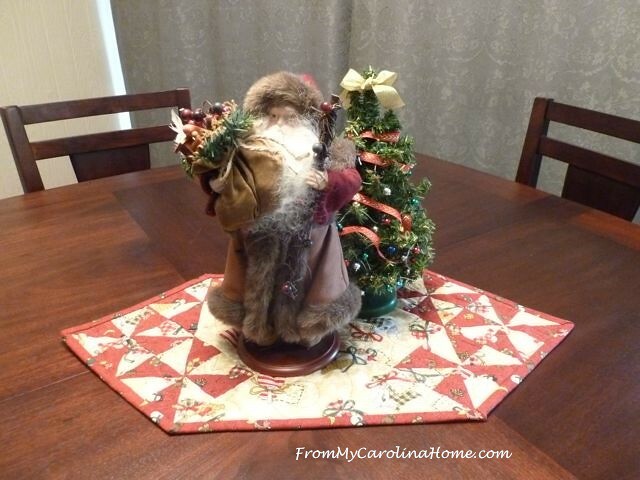 But I also like it on the pub table with a woodland Santa and a little tree. Maybe I just need to make another one! 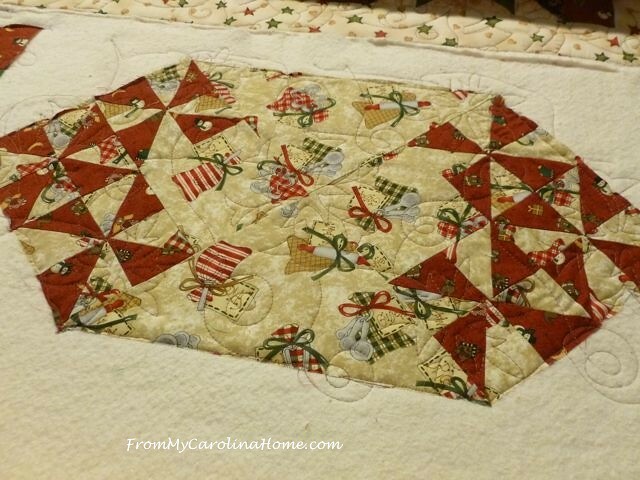 Next up is a Christmas Hexagonal Table Topper, downloadable instructions with a template available on that post. 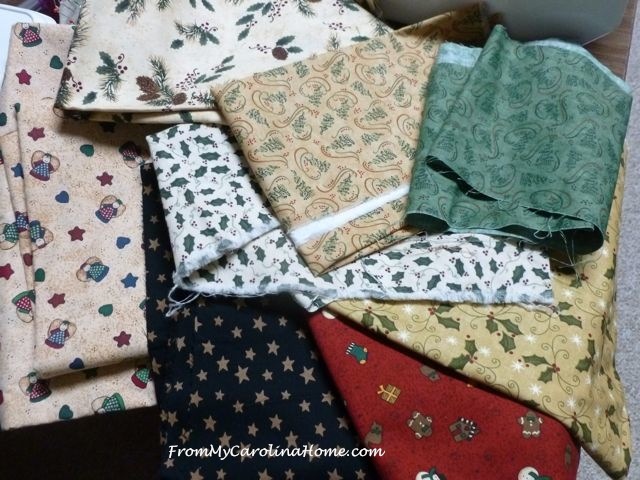 I still have lots of Christmas fabrics, and I am really inspired right now. 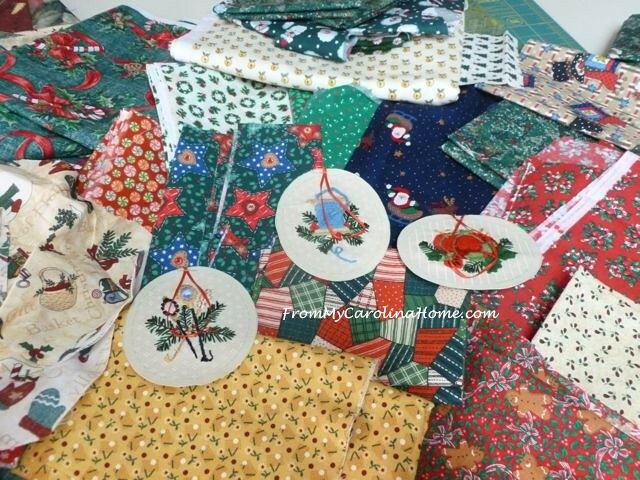 Plus there are all these fabrics too, what I didn’t use on the ornaments. More tables to decorate too. I am going to try a new-to-me technique on the next project, and I’ll have that for you soon! 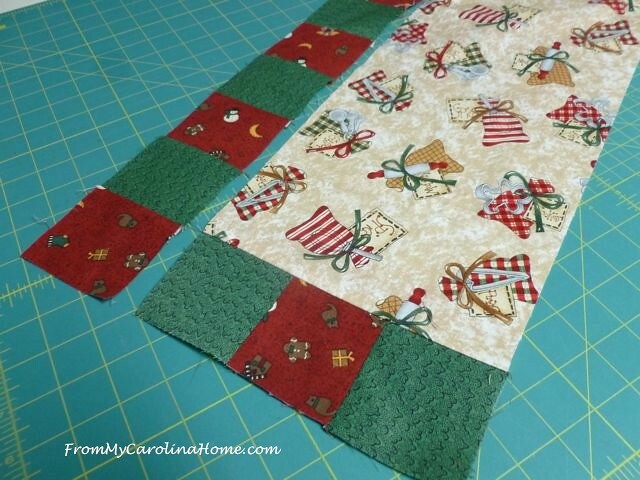 Are you sewing any holiday themed projects? 😀 you are much more ambitious than me. Great post. 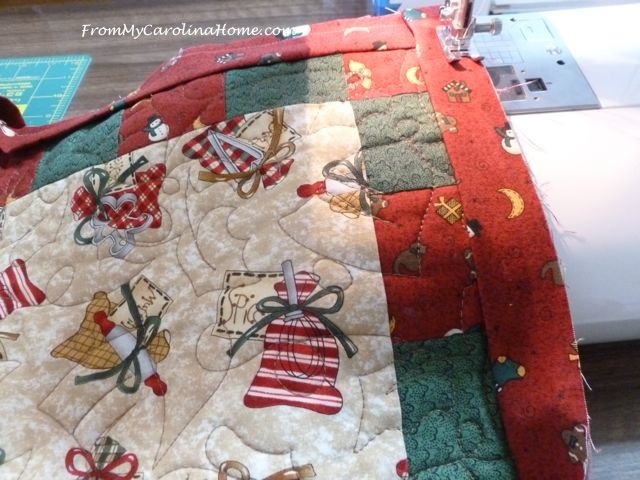 I love all your new Christmas quilts and am in awe of all your decorative elements. No room in our apt for all that stuff, so we seriously deaccessioned before our move across the country! 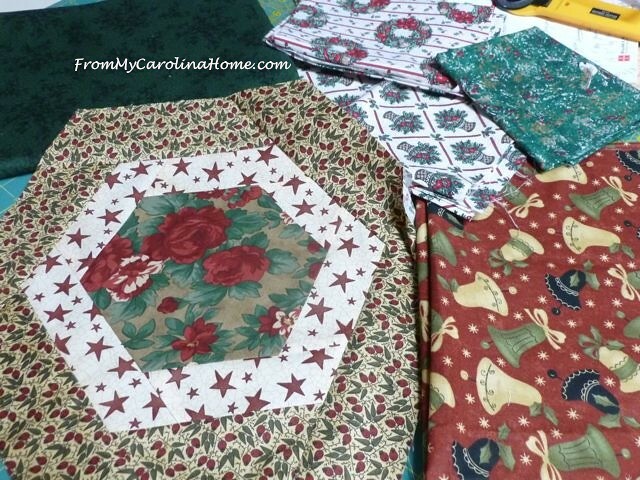 I think I will keep track of the hexagon topper idea, but make it bigger to mostly cover my 42″ round table – very interesting technique, super easy to execute, but I will use fabrics for another season. Continue to have a terrific run-up to Christmas. Carole, Sorry I am a day late on posting a reply, I was super excited to get my table runner quilted yesterday and never did get back to the computer. 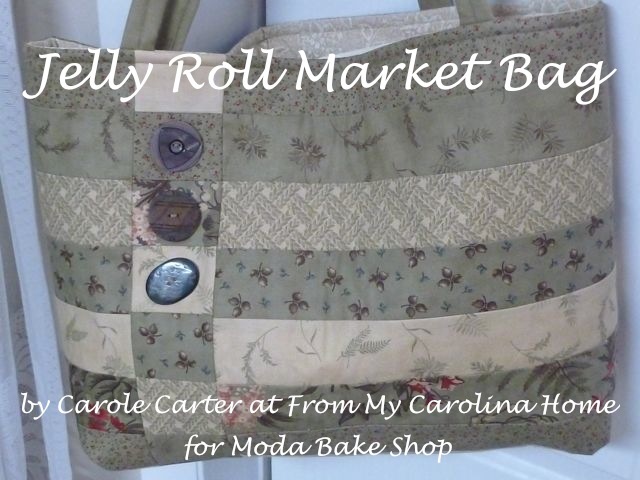 I absolutely love the table runner your designed! I did not get it completed though…imagine that from me LOL! I have a few more stitch in the ditch rows to quilt and then I still have to get the binding made and then bind it. Hopefully, if all goes according to plan I will post pictures tomorrow! I am hoping that I will have the opportunity to make several others for this years gifts and for next year as gifts and for myself also! Now what you posted today are also great ideas. I usually love to decorate the house for Christmas, but this year I am having so much fun creating hand made gifts and am running out of time (imagine that) that Kevin told me not to worry he would take care of all of the decorating and for me just to keep creating. I have not even been spending much time on the computer. Later on today though we are going over to my parents to visit for a few hours and stop by the dollar store and try really hard to get my Father to go for a drive to look at some of the Christmas lights. It has always been something he has loved to do every year. His health is really starting to have its toll and he rarely leaves the house any more. So, we want to really try and make him an extra special Christmas. Well, off I go…Thank You so much for sharing all of these great ideas! I hope that you have a wonderful creative day! 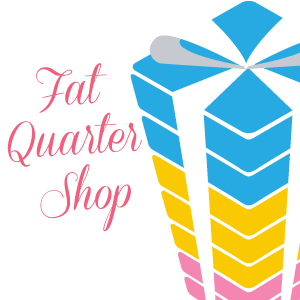 You have some great Christmas and holiday fabrics. Love your table runners. 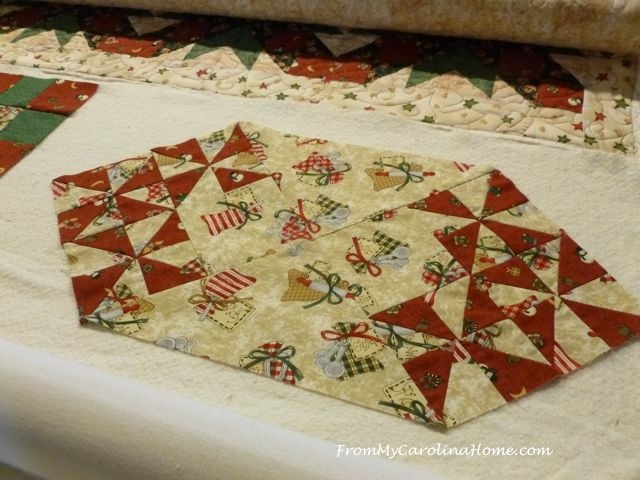 Beautiful projects for the holidays Carole and I am so tickled you made the little Pinwheel table topper! I am also making a couple more! 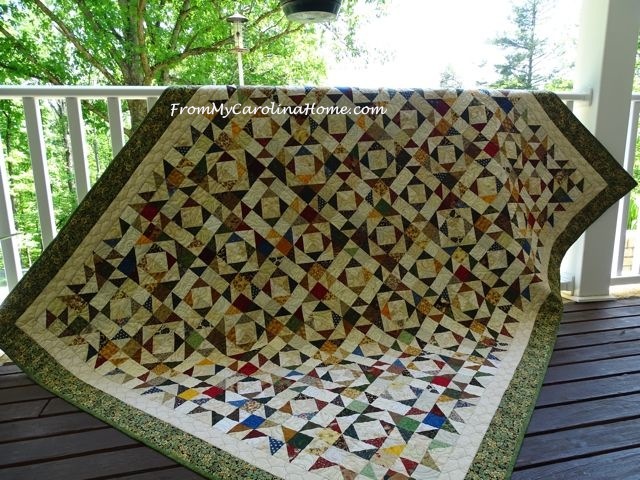 How neat to quilt the smaller projects on your long arm! What a festive holiday home you have!! It was good to see the way you loaded the runners at the end o quilt. Smart thinking? I’m guessing it’s the same backing as the quilt. 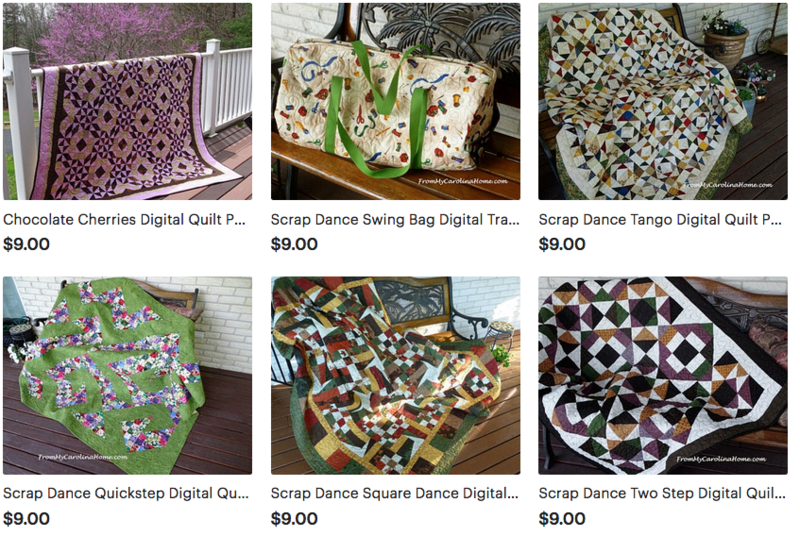 Have you pieced another backing to limit the loading time for doing multiple quilts? New-ish longarmer here. Thanks!